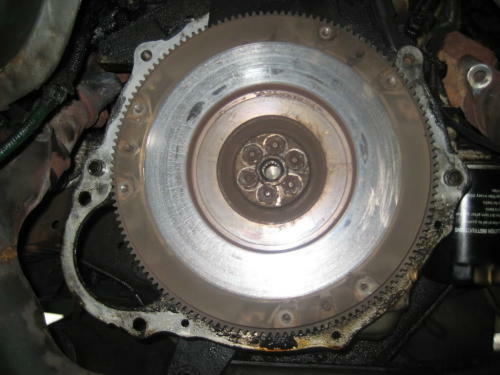 Brief Explanation: A few years ago, I lost the ability to use 4th gear in my transmission. After a few more years of abuse, I finally got around to changing my transmission. 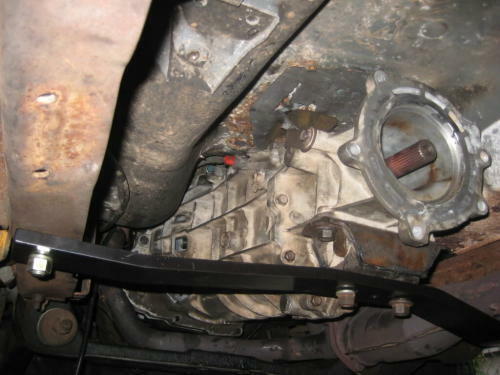 Rather than rebuilding it or replacing with another FM146, I installed a M5OD transmission because it is a stronger transmission and should last longer. 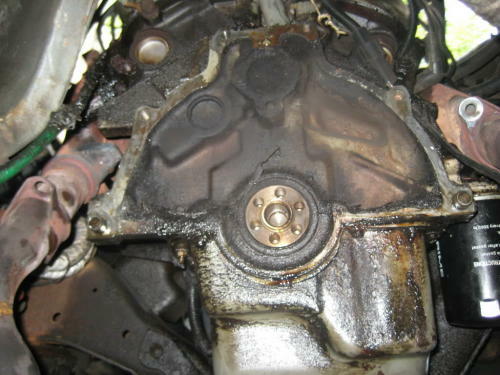 My transmission came out of a ’96 Ranger with about 95,000 miles. 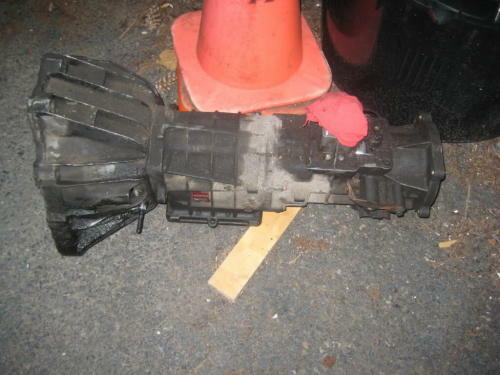 I bought the transmission for $300. 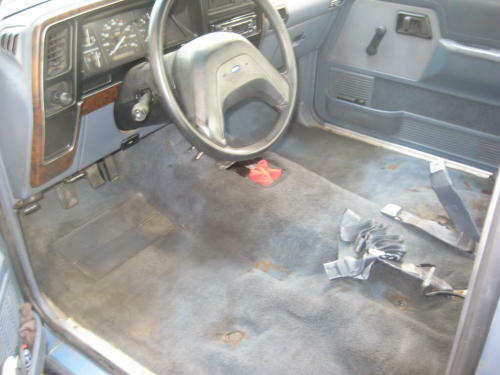 This is how I converted my 1989 Ford Ranger’s transmission to the M5OD. 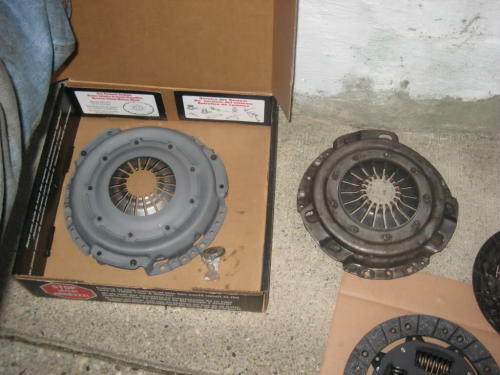 I took advantage of this project to also change my clutch, flywheel, and starter with the parts for a 4.0L engine, upgrading the clutch from 8-7/8″ to 10″. 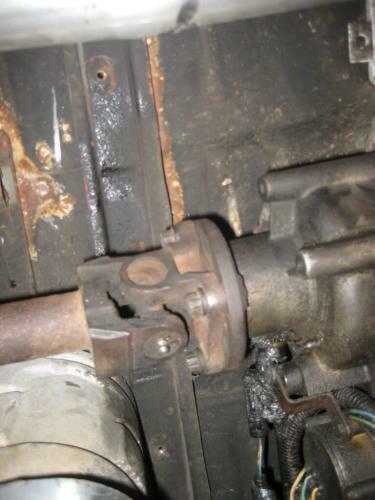 I also replaced my rear main bearing seal and clutch hydraulics as some added security. 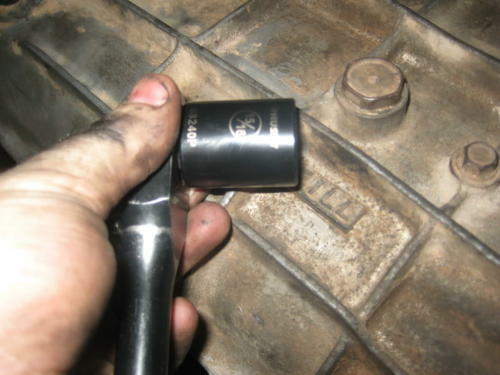 Disconnect the rear driveshaft from the transfer case using a 12 point 12mm socket. 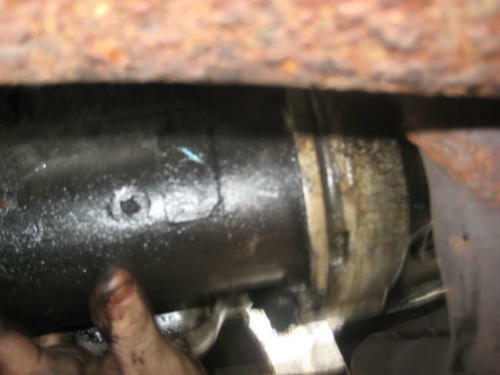 I did not bother to remove the driveshaft from the rear axle because it wasn’t really in the way. If you think you will need the extra room, remove it. 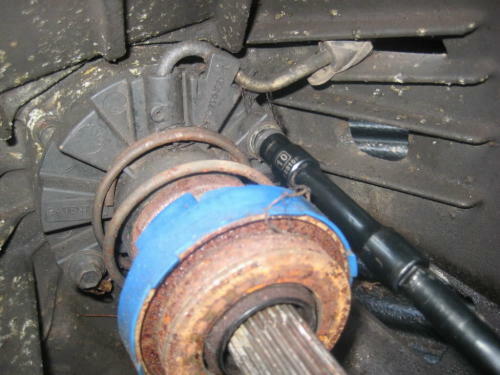 Disconnect the front driveshaft from the axle by removing the four torx bolts holding the yoke straps on. You will need a T30 socket for these. 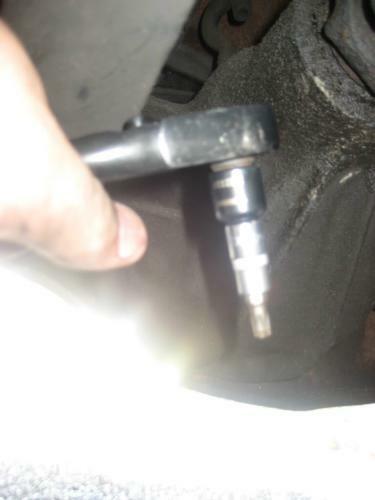 The BW1350 has a front slip yoke, so you can just pull the driveshaft out of the transfer case, but if you haven’t drained it, expect some ATF to follow. 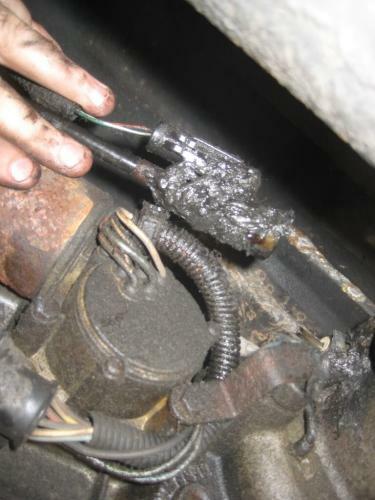 Unplug the wiring from the transfer case. 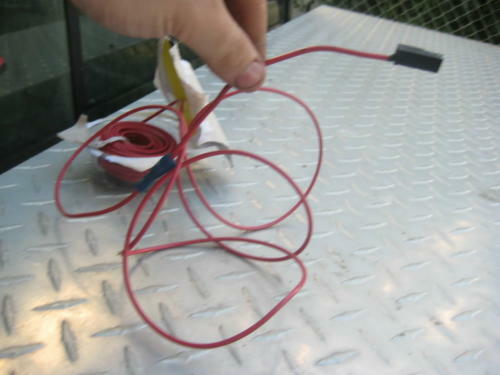 For my electric transfer case, I have two sets of wires. One is the electric controls and the other is for the speedometer. 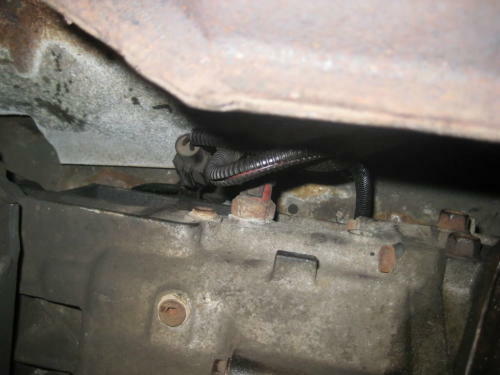 Disconnect the vent hose on the transfer case from its location on the transmission so you do not rip the hose when you remove the transfer case. 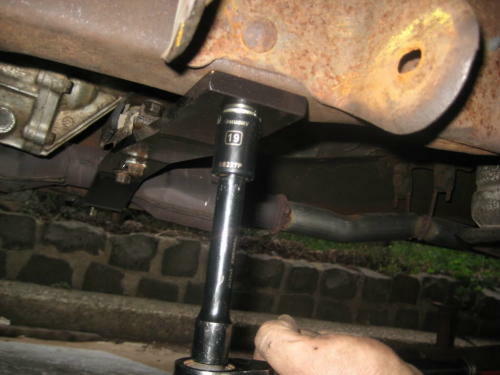 Support the transfer case using a jack stand. 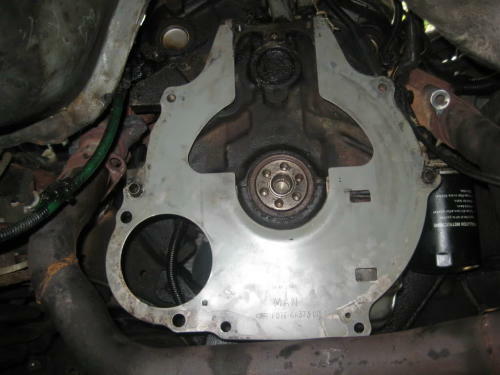 Remove the transfer case skid plate. It is held on by four 13mm bolts. 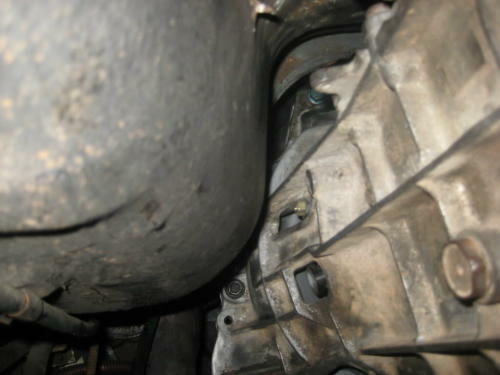 Disconnect the transfer case from the transmission. There are five (I had four but I think I was missing one) bolts holding them together. 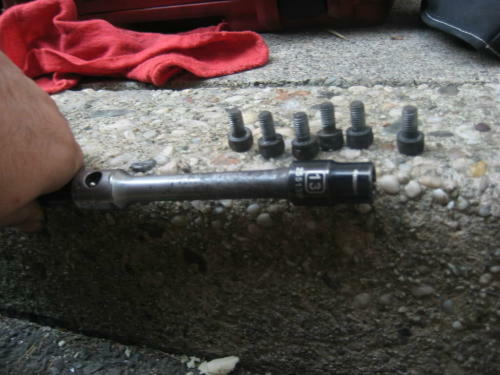 Three of my bolts were 13mm and the fourth was 15mm. 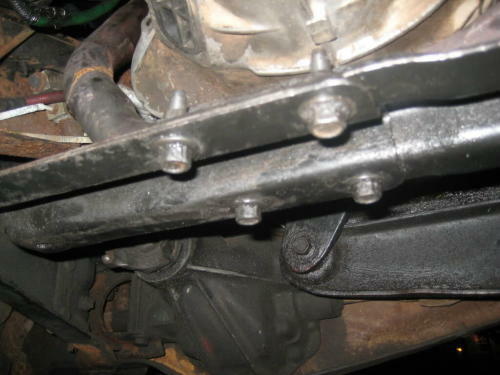 The bolt heads are accessible from the transmission side. 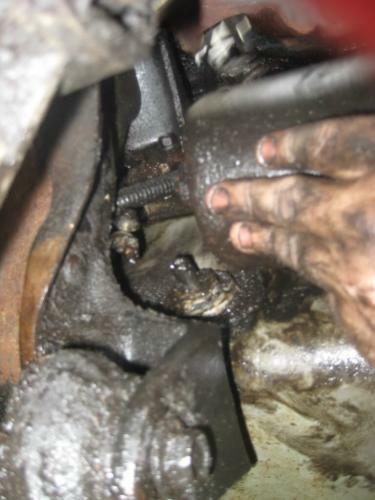 You can see I left my front driveshaft in the transfer case so that I did not make a mess. 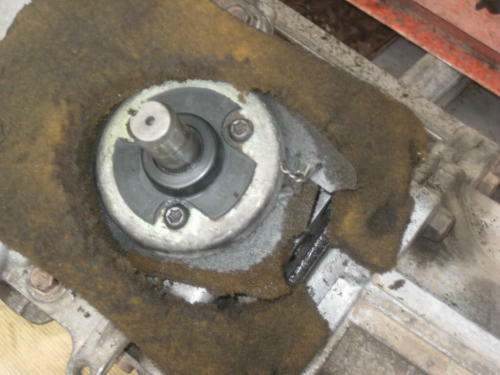 If I had to do it again, I would drain the fluid first and remove the driveshaft from the case. 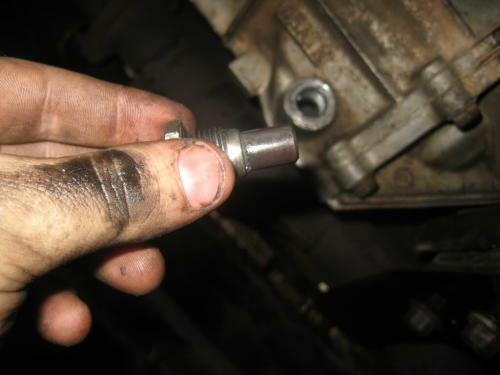 Remove the starter by taking out the two 17mm bolts holding it in. 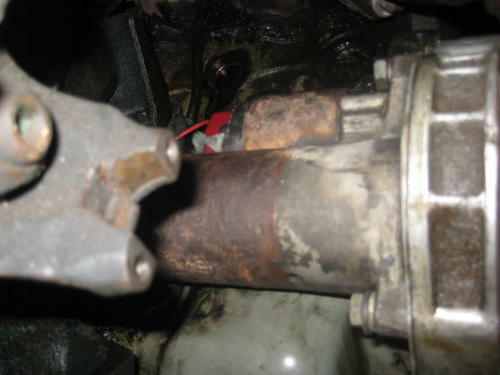 Then disconnect the bolt holding the wire to the starter and pull the starter out. 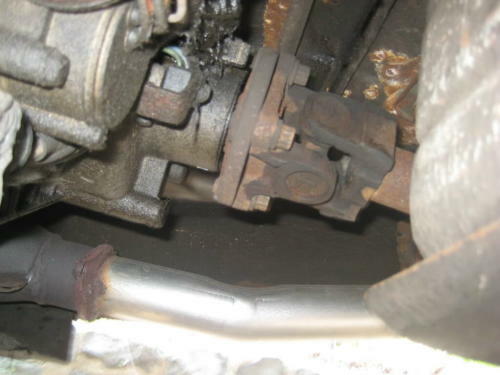 To help facilitate the removal and installation of the transmission, remove the Y-pipe from the exhaust manifold. Each side is held in by two 14mm bolts with 14mm nuts. 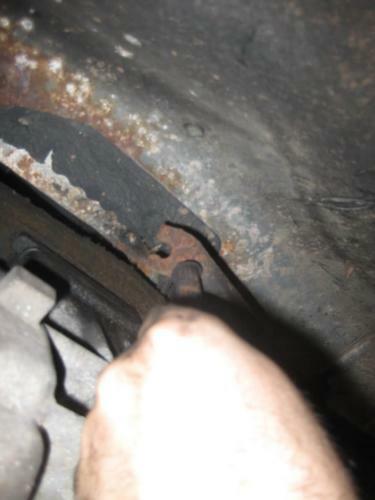 You may need some extensions and wrenches to remove these bolts. 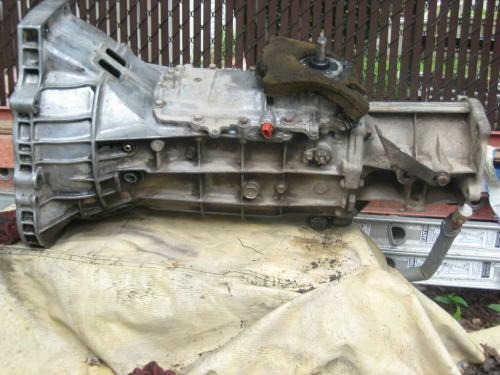 Remove the wiring to the transmission. 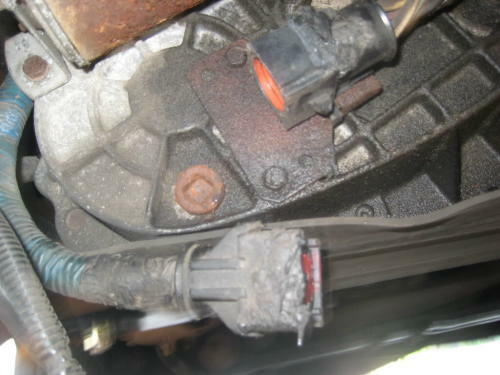 The transmission has two plugs to remove–one for the reverse lights and the other for the neutral safety switch. 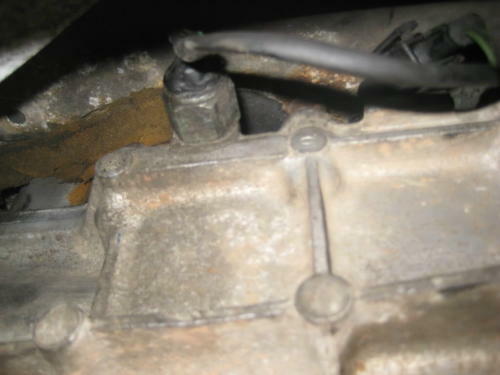 Also remove the hydraulic line from the transmission using the appropriate hydraulic tool. Unfortunately, my line was mangled and would not disconnect, so I ended up cutting my hydraulic hose. 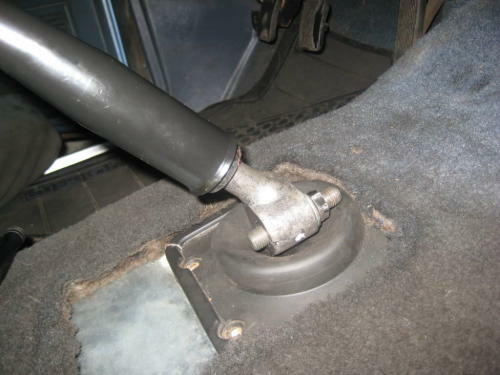 Remove the shifter boot by removing the four screws holding it to the floor plate. 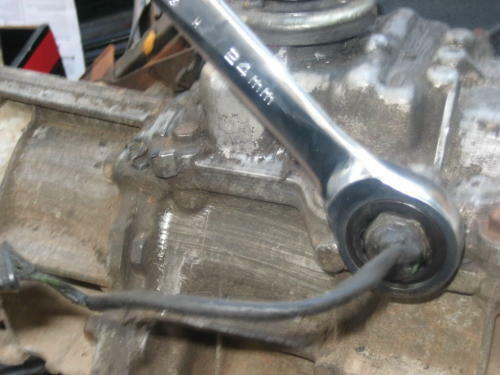 Remove the shifter by removing the four T40 screws holding the shifter assembly in the transmission. Unfortunately, one of my screws was stripped so I had to use a bolt-out, but it worked. 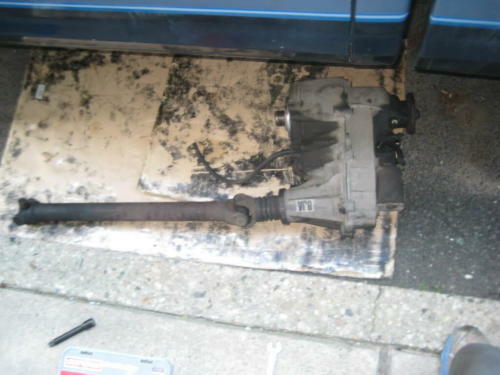 You are now ready to begin removal of the transmission. 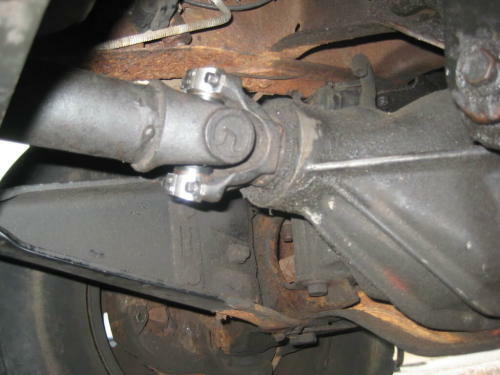 Support the transmission with a jack and/or jackstands. Remove the transmission crossmember. 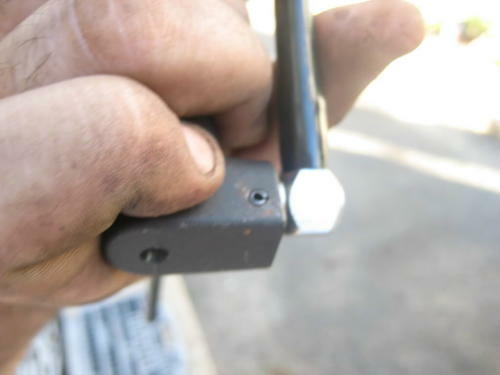 I have an aftermarket crossmember from suicidedoors.com, so my bolts may be different than yours. First remove the two 18mm nuts holding the transmission mount to the crossmember. 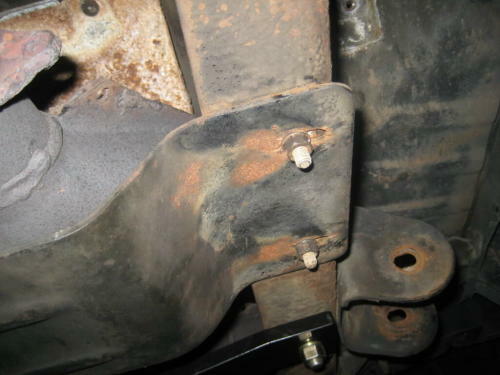 Then remove the two bolts holding the crossmember to the frame. I have 19mm nuts attached to bolts with a 3/4″ head on my crossmember. 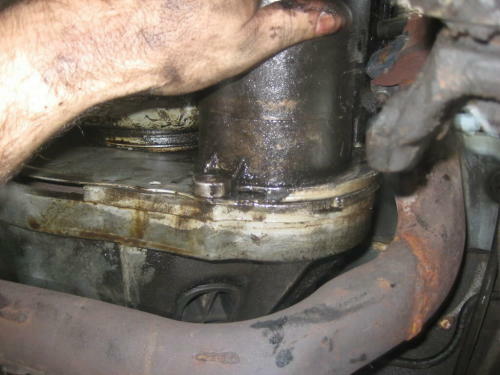 Remove the transmission. Be careful here that you do not crush your exhaust pipe. Do this part with a helper. 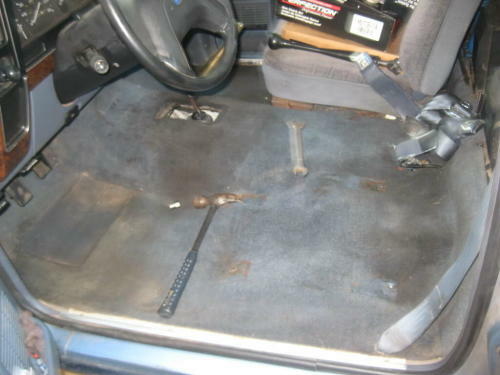 To ease the removal of the floor plate, I removed my seats using a 13mm socket. I took the opportunity to clean my interior a bit and fix the seat adjustment lever beneath the seat. 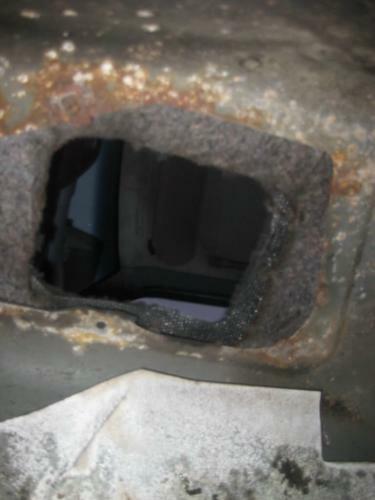 To remove the floor plate, unbolt the four 8mm bolts holding it in to the floor. There is one bolt in each corner of the plate. 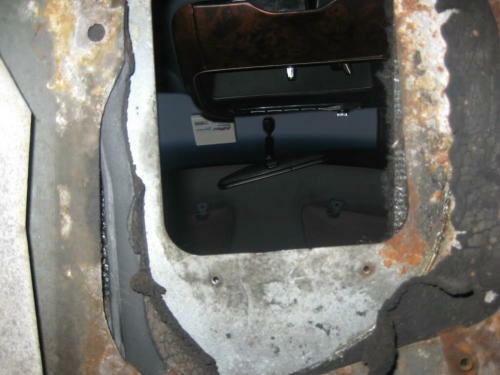 Remove the floor plate through the bottom of the tunnel. 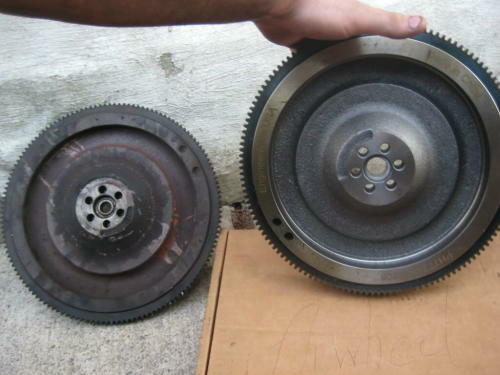 Here is a comparison of the two floor plates (M5OD plate on top, FM146 plate below). 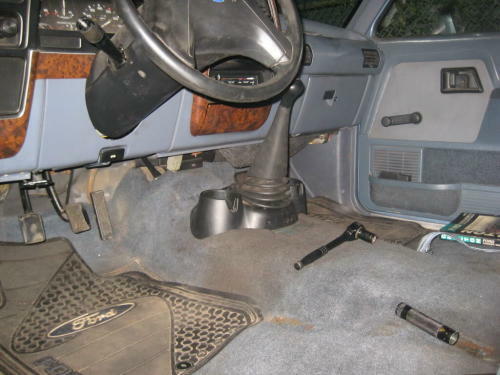 Notice the M5OD shifter will sit a few inches further toward the front of the truck. 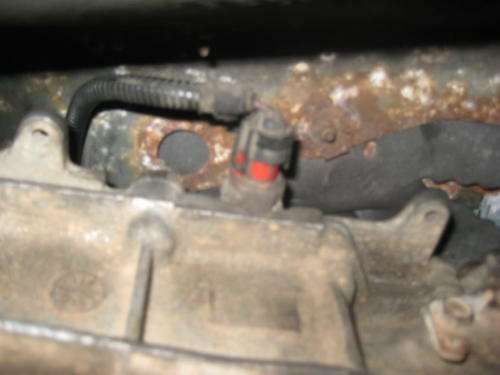 If you are replacing the master cylinder, unbolt the reservoir using a 8mm socket. My cap went missing after an oil change one day, so I replaced it with a Coffee Mate cap. It made for a surprisingly nice fit. 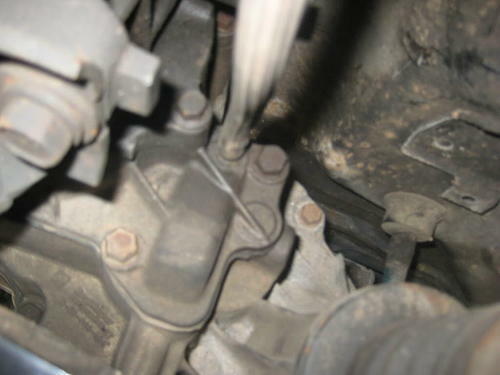 The master cylinder is held on by two 10mm bolts. 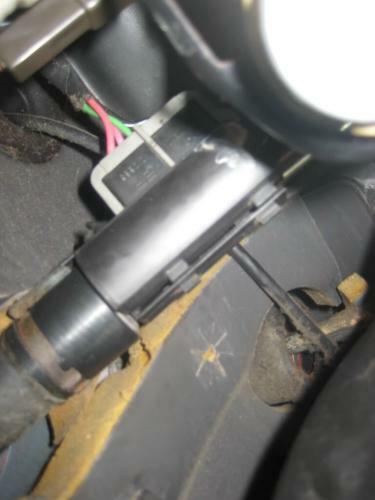 There is a clip holding the the pushrod to the clutch pedal. 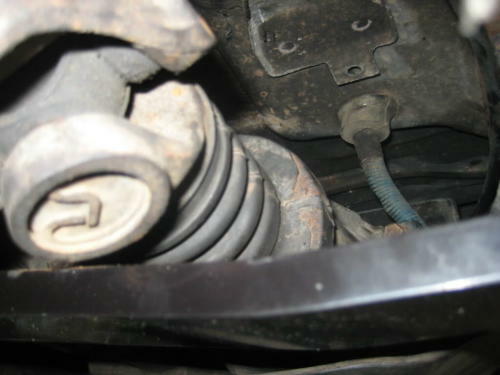 If you remove the clip, you can slide the master cylinder out. 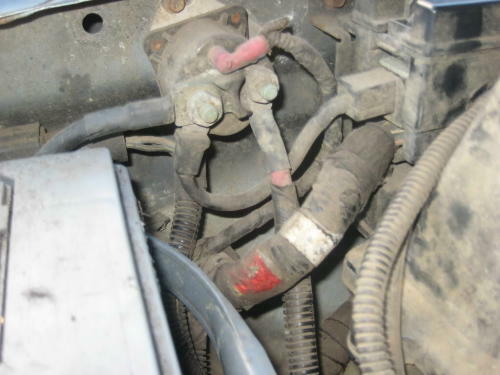 If the hydraulic line is disconnected from the slave cylinder, you can now remove the master cylinder/hose/reservoir from the truck. 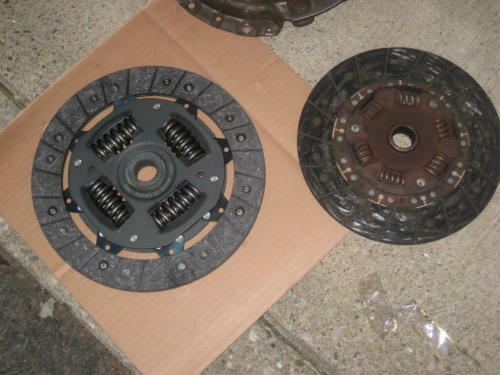 If you are replacing your clutch (and you should), now is the best time. 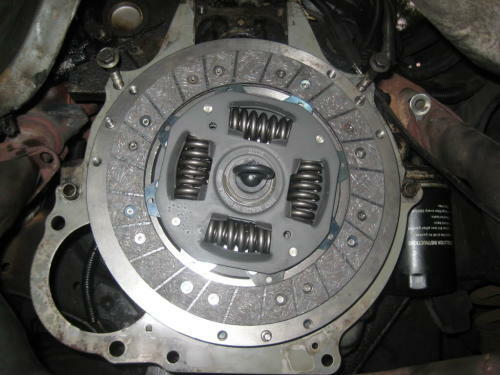 Remove the six 13mm bolts holding the clutch cover to the flywheel. 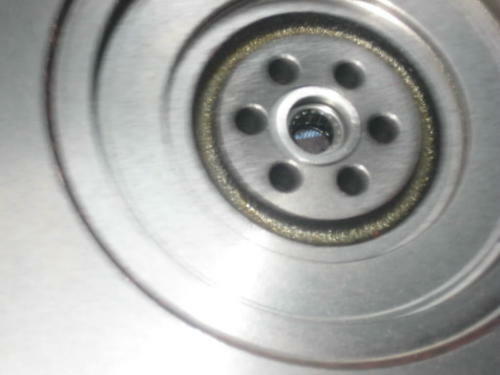 The pressure plate is held behind the cover, so be ready to catch it when you remove the cover. 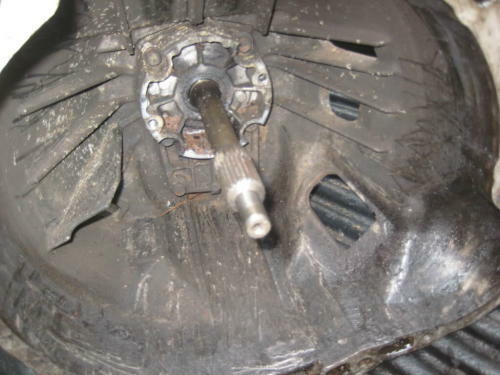 To remove the flywheel, remove the six 17mm bolts holding it to the crankshaft. 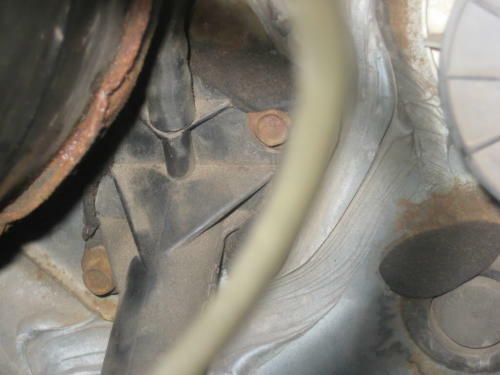 It will spin when you try to remove the bolts, so place a 19mm socket on a breaker bar on the pulley on the front of the motor to prevent the flywheel from spinning. 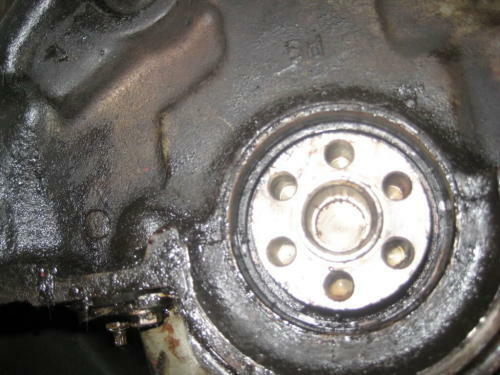 Remove the flywheel. Remove the block plate by sliding it off the dowel pins. 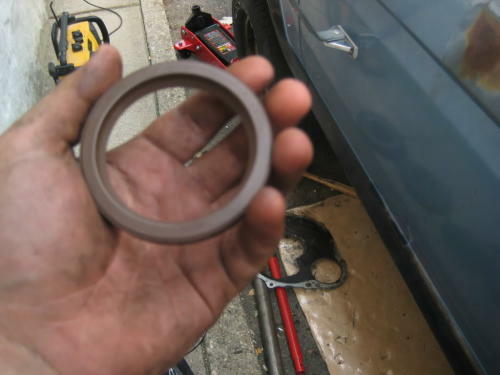 While you have the clutch off, it doesn’t hurt to replace the rear main bearing seal. I picked one up at Advance Auto for like 10 bucks. It is a little insurance just in case the one in there is on its way out. Do you really want to go through all this work again soon because you wanted to skimp on a $10 part? Apply RTV to the sealing surface and grease to the sliding surface. If your freeze out plugs are leaking now, replace them. It will be much easier to do this without the transmission in the way. Mine were not leaking, so I left them alone. 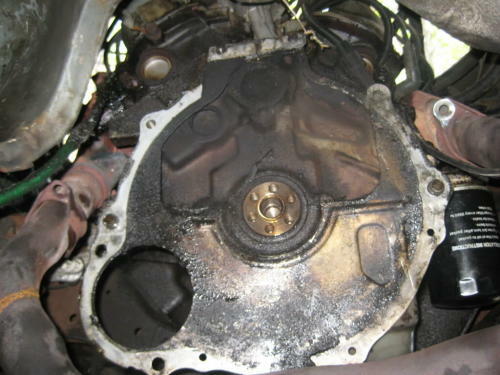 It is also a good idea to replace the slave cylinder on your new transmission. I bought one for $60 at Advance Auto with throwout bearing included. To remove the old slave, remove the two 10mm bolts holding it on. 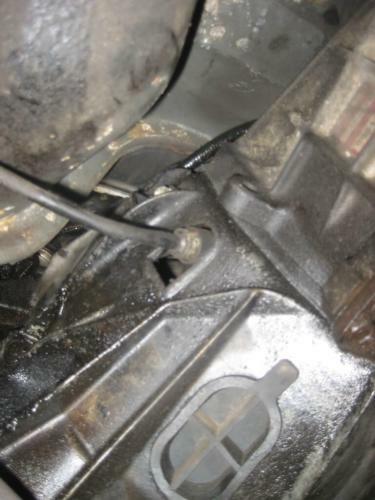 To ensure you have the right part, get a slave cylinder for a ’91 or ’92 4.0L Ranger. 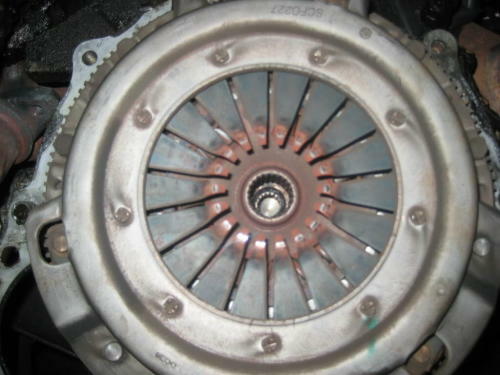 The clutch for the 4.0L engine is a bit bigger (10″ instead of 8-7/8″). Compare the difference. Now it is time to reinstall everything. First, install the 4.0L block plate. Next, install the pilot bearing into the flyhweel. Press it in or gently knock it in. Be sure to put it in the same orientation as the one you took out. I almost forgot to install this pilot bearing. 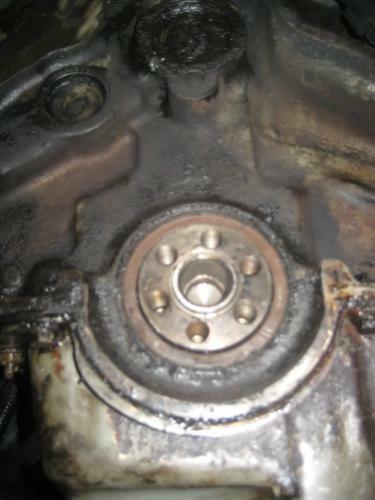 DO NOT FORGET THE FREAKING PILOT BEARING! 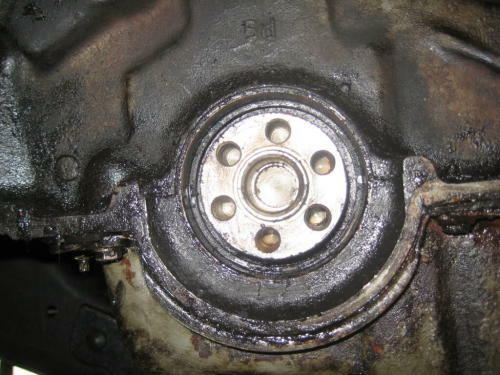 Install the flywheel and pilot bearing. 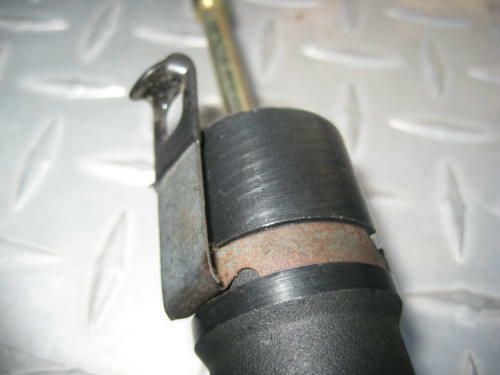 Remember to move your breaker bar on the pulley so that the flywheel will not turn. 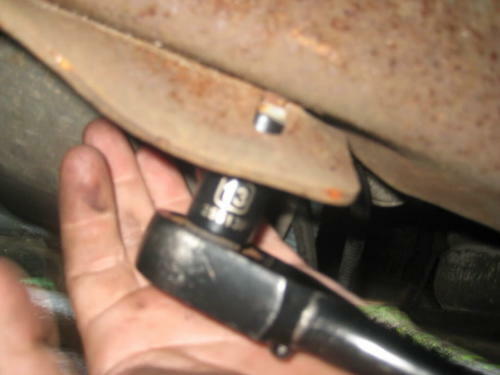 Use the clutch alignment tool to guide you. Torque to 59 ft-lb in a star pattern. 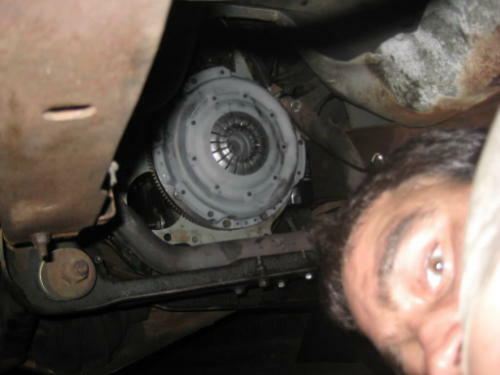 Install the clutch cover. Torque to 20-25 ft-lbs in a star pattern. I was very dirty. Transfer the noise reducing sponge from your old transmission (optional). I also transferred the neutral safety switch because the M5OD’s was broken. It was a direct swap. 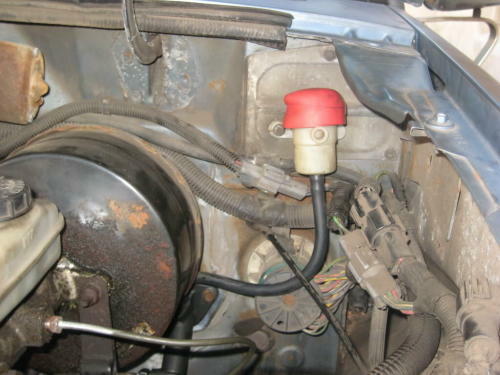 Use a 24mm wrench to remove and install the switch. Here is the M5OD ready to go in. It took some time and creativity, but I solved the problem. 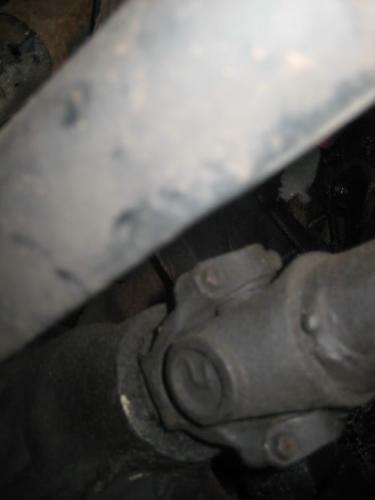 I found it was easier to install the transmission with the bolts removed from the radius arm bracket near the exhaust. They have 15mm heads. Install the M5OD. A good floor jack and a helper make this step a lot easier. 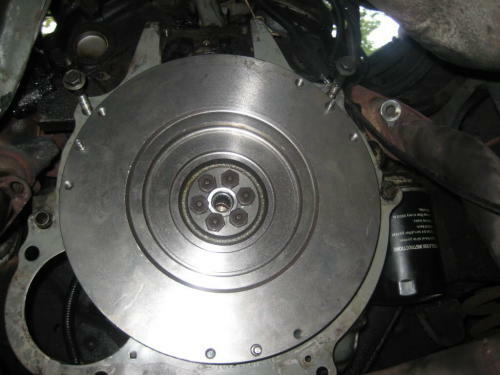 Install the bolts into the bellhousing to mate the transmission to the engine. I only had 3 bolts (Meineke lost some when the did my clutch last time, I assume), so I picked up some more. Torque the bolts to 20-30 ft-lbs. Unfortunately, I could not find exact replacements for my bolts, so I now have two 13mm, two 14mm, and two 16mm bolts installed. At least it’s better than only 3 bolts. 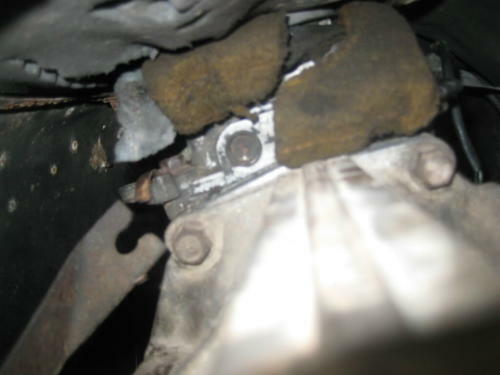 If you need to replace your transmission mount, do so now. Torque to about 50 ft-lbs. 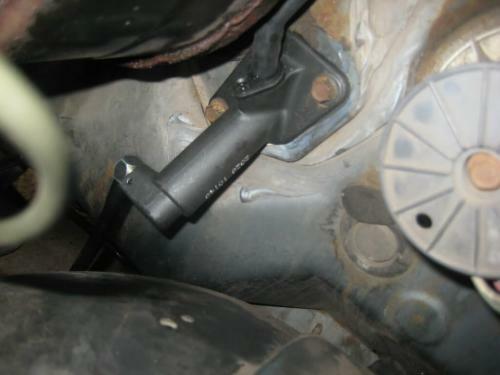 Reinstall the four bolts on the radius arm bracket near the exhaust using a 15mm socket. 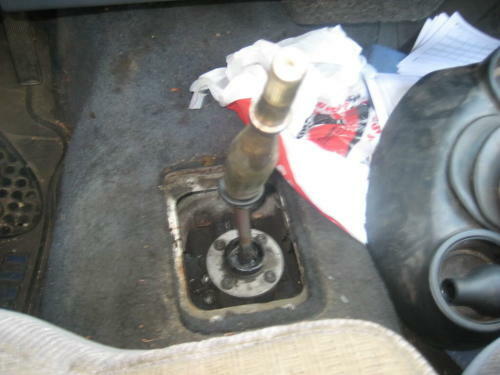 Place the shifter rod onto the nub and bolt it in. 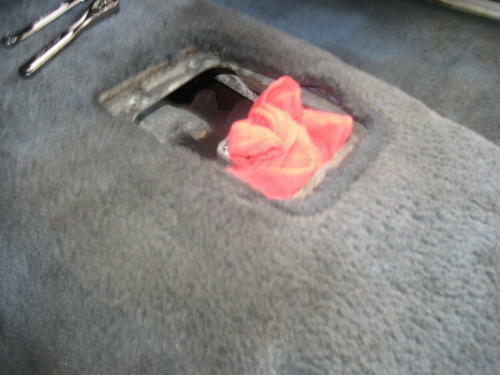 Place your shift boot onto the shifter rod, bolt it in, and push the shifter knob into place. You can now bolt your seats back in. 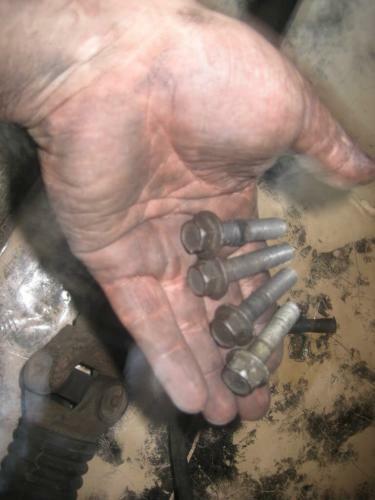 These bolts are 13mm. Hook up the wiring for the transmission. There are two plugs. 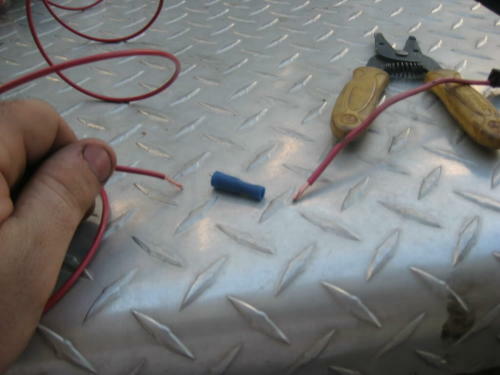 Even though they are not in the same location as the plugs on the FM146, I did not have a problem with my plugs. 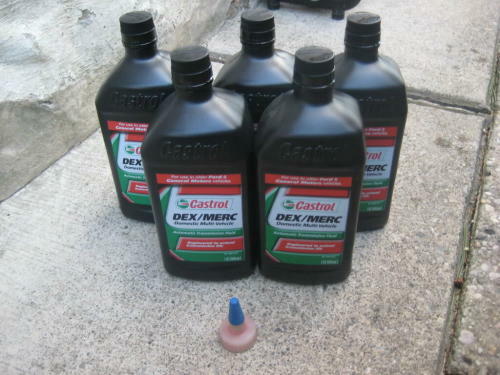 Don’t forget to install some fresh fluid into your transmission. I was told to use Mercon ATF. You can see the squirt attachment I use to transfer fluids. To do so, first remove the fill plug (in case it is frozen). 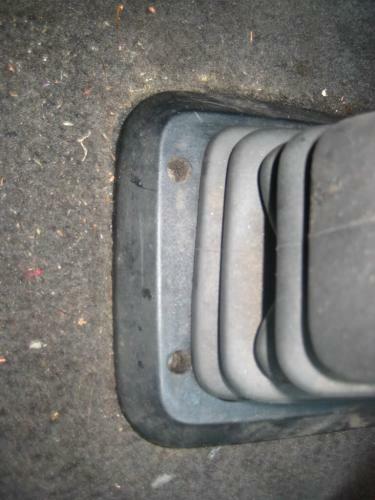 It is the higher plug on the driver’s side. 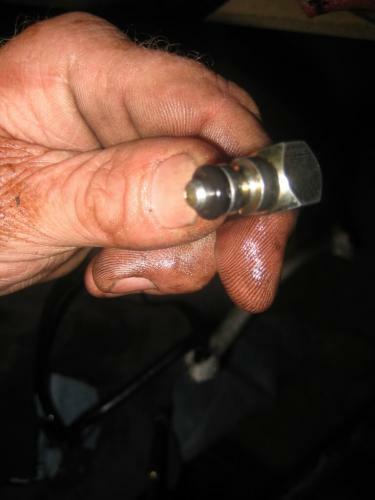 The fill plug and drain plug are both 15/16″. Then remove the drain plug. My case was already, but yours may drain some fluid, so have a pan ready. Clean the magnet and reinstall the drain plug. Fill the transmission with some Mercon ATF. Mine took just under 3 quarts. Reinstall the fill plug and dispose of any used ATF. 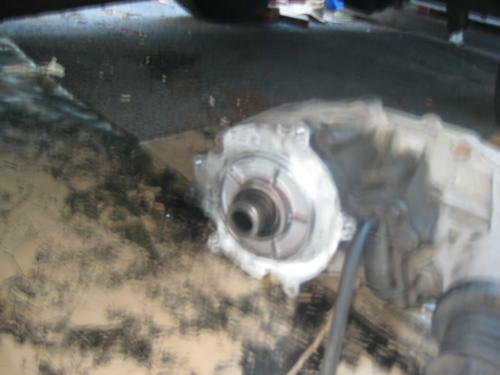 Put the transfer case back into the rear of the transmission. It helps to have a jack or jack stands here. 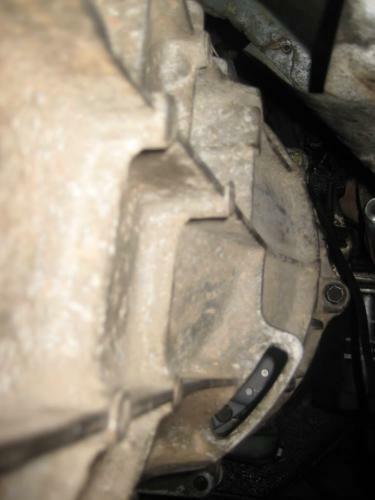 I put some RTV on the transmission to transfer case mating surface because I noticed there was some on there before. 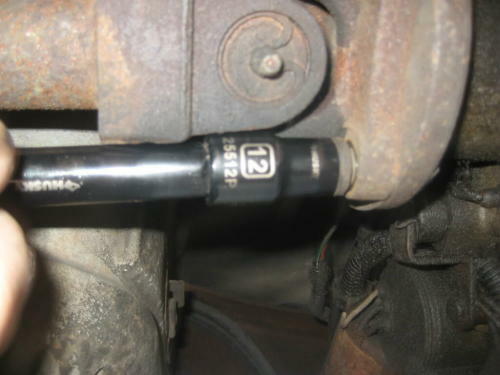 Reinstall the rear driveshaft using a 12 point 12mm socket. 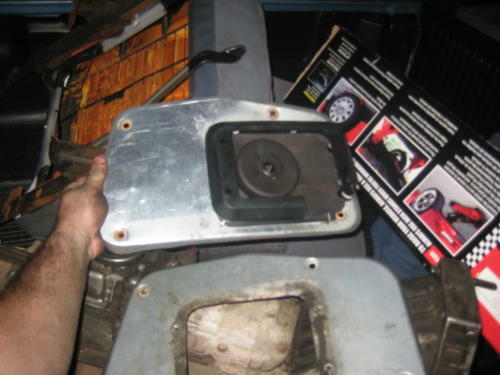 Reinstall the transfer case crossmember. The bolts and nuts are 13mm. 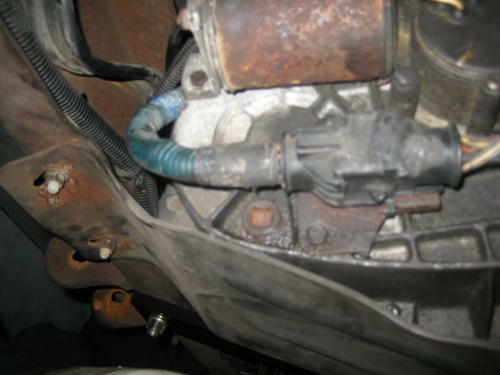 Hook up the wiring for the transfer case. 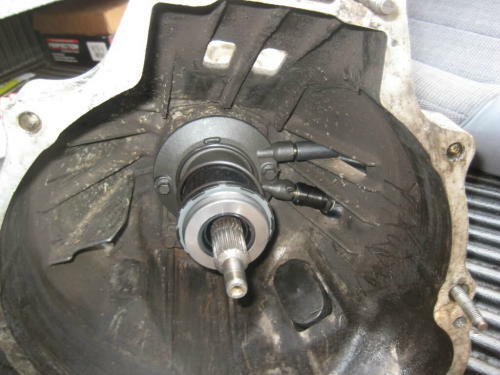 If you have the electronic transfer case, there should be two plugs. 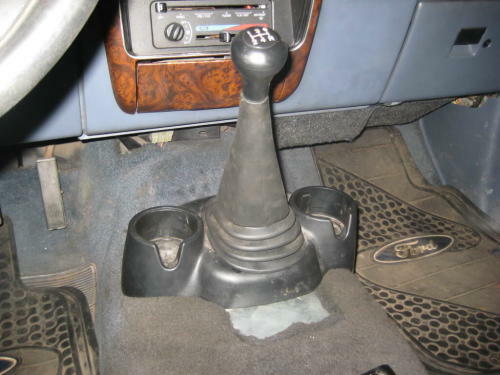 If you have a manual transfer case, I assume there is one. We will have to fabricate some wire here because of the different design between the 2.9 and 4.0 starters. First, crimp a piece of wire to the end of the small wire on the 4.0L starter. Next, move the large wire that originally went to the 2.9L starter from the firewall side of the solenoid to the battery side. You will need a 9/16″ socket for this. 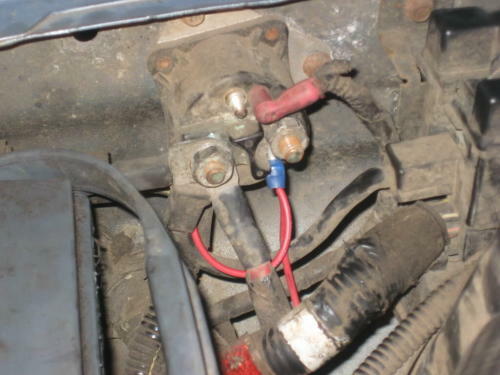 Next, run a wire (16 gauge or so) next to the original 2.9L starter wire up to the solenoid and bolt it to the firewall side. You will need a terminal with a 3/8″ hole. 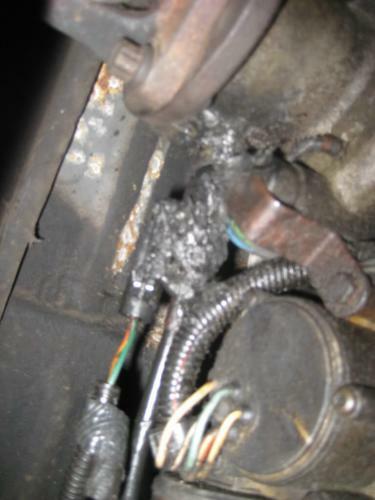 I had to enlarge the terminal from the 2.9 starter wire. Install the wires onto the 4.0L starter. 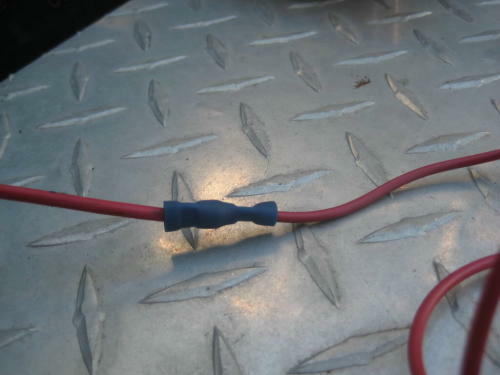 The nut that holds the large wire on it should be 14mm. 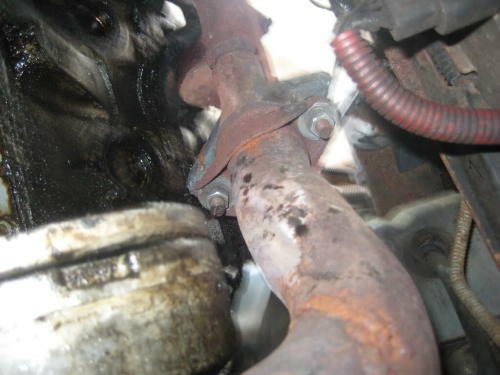 Then bolt the starter in. 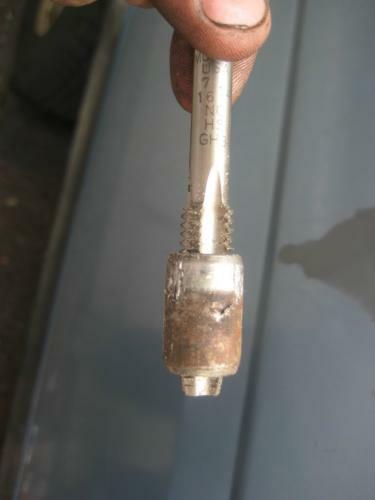 One of my 2.9L starter bolts was too short so I replaced it with a longer bolt and some lock washers (it was not threaded for part of it). 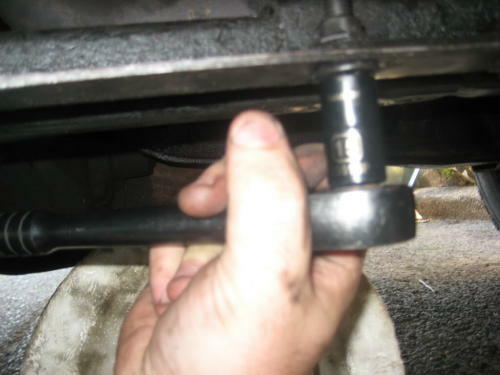 A 17mm stubby wrench or crowfoot helps for the installation of the upper bolt. 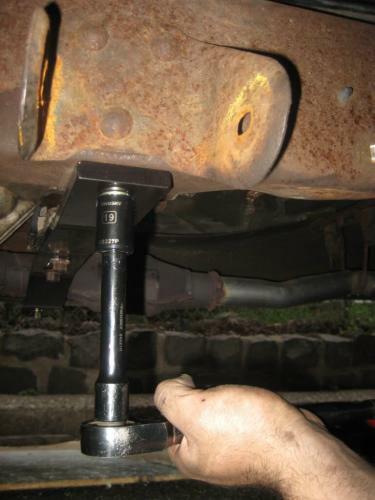 Install the front driveshaft into the slip yoke at the transfer case and tighten the yoke straps using a T30 torx socket. I replaced my yoke straps and bolts because a bolt was stripped. 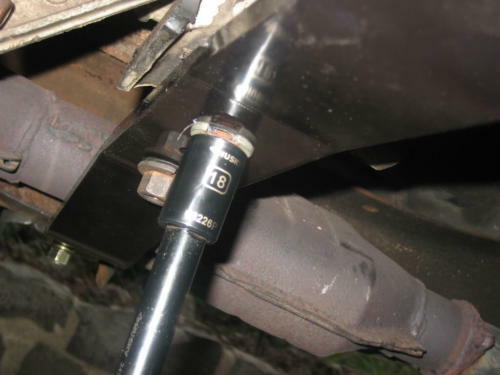 My aftermarket crossmember almost hits the driveshaft, but it clears it. 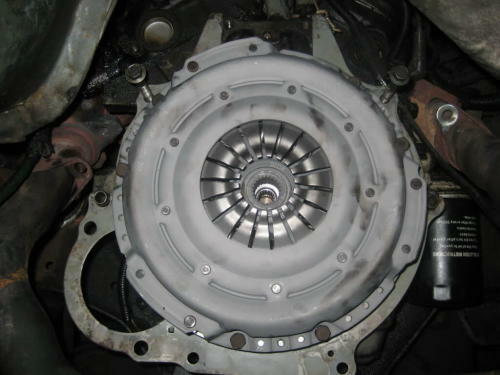 Refill the transfer case with some Mercon ATF. 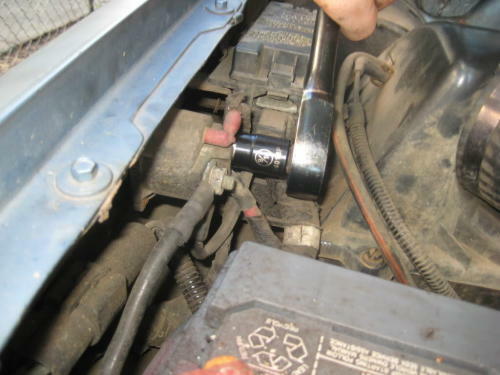 The drain plug and fill plug are both 3/8″ square, so you can just use a 3/8″ ratchet extension. Now we need to replace the clutch master cylinder. 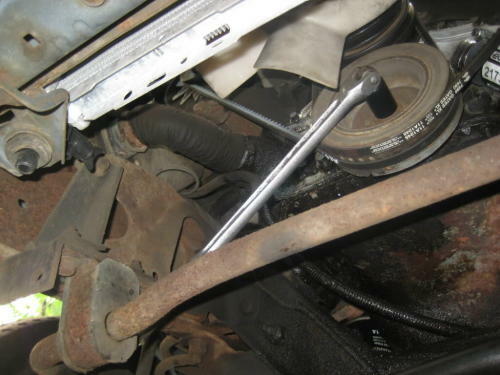 Install the pushrod by just pushing it into the groove. 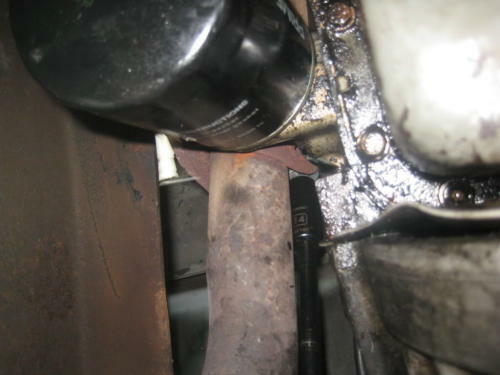 Also install the rubber bushing around the rod. 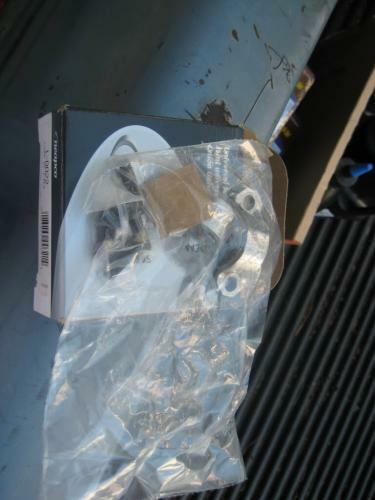 Transfer the clip from the old master cylinder to the new one (if it did not come with one). 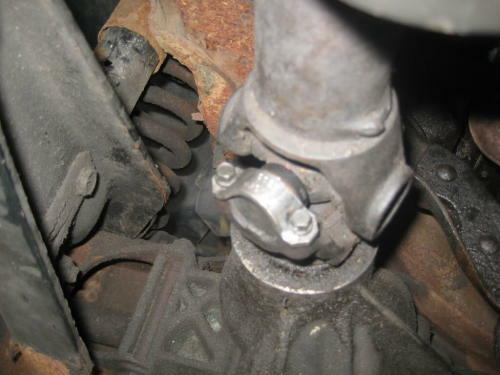 Install a new small O-ring onto the clutch hose at the master cylinder side. 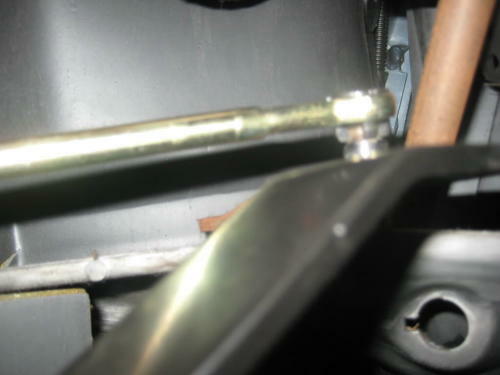 Install the hose into the master cylinder by inserting the roll pin. I used a small hammer and a pair of pliers for this. 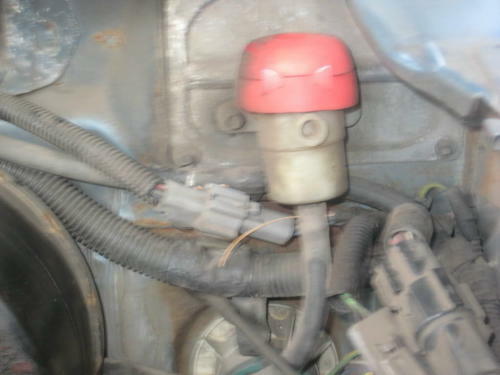 Feed the master cylinder into the firewall and bolt it back in with a 10mm socket. Bolt the reservoir back into place using an 8mm socket. 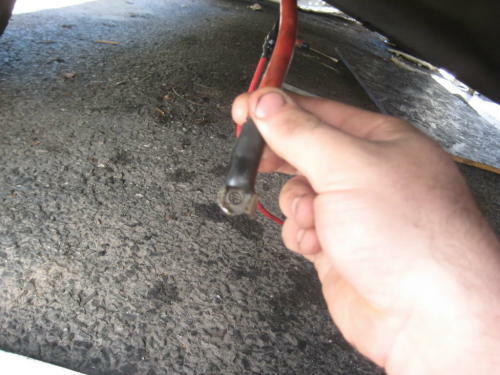 Get inside and clip the wiring onto the pushrod and attack the pushrod to the clutch pedal. Connect the other end of the hose to the slave cylinder at the fitting. 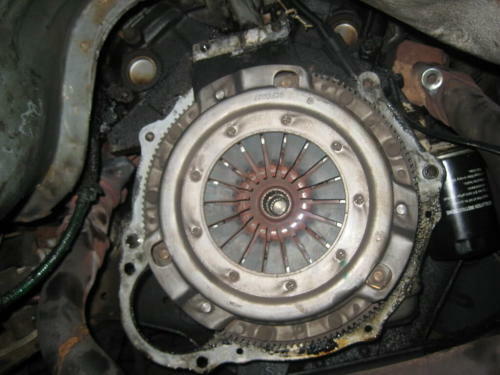 Bleeding a clutch is similar to bleeding a brake system. I had some trouble with my quick disconnect fitting, so this took me much longer than it should have. 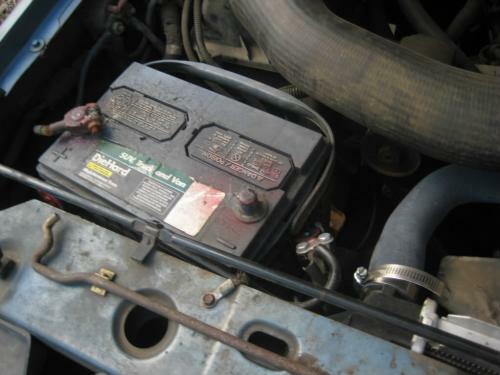 First, fill the reservoir with DOT3 brake fluid. 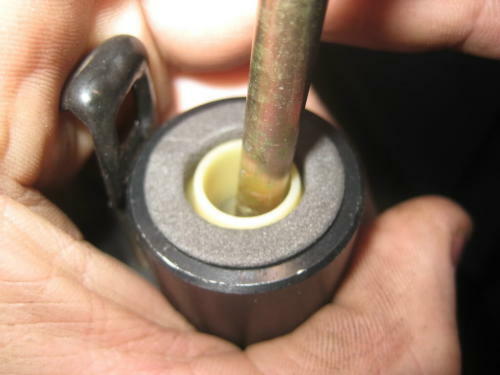 Open the bleeder screw above the hose at the slave cylinder until you have a steady stream. Be sure to keep the reservoir full. 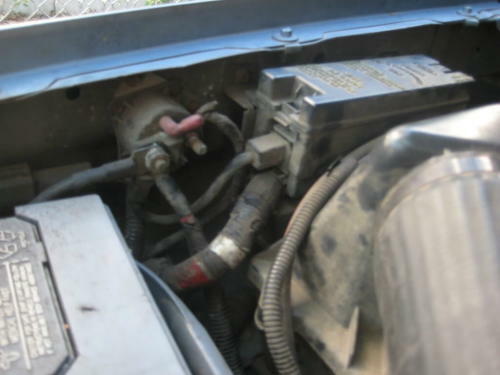 If your fluid falls too low, air will enter the system and you will have to start over. Then close the bleeder valve. Slowly press the clutch pedal five to ten times and hold it for 1-2 seconds each time. Release the pedal quickly each time. Fill the reservoir to the top and open the bleeder valve. You should not have any air bubbles. If you do, repeat this process until the air is gone. Now, hook the battery back up and test. Congratulations! You have now successfully converted your FM146 to the stronger M5OD and upgraded your clutch and starter. 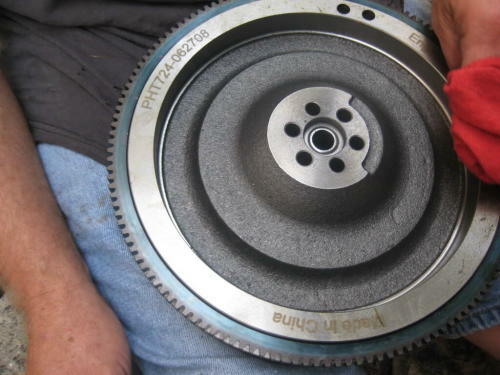 Enjoy the added strength of your new transmission and clutch. 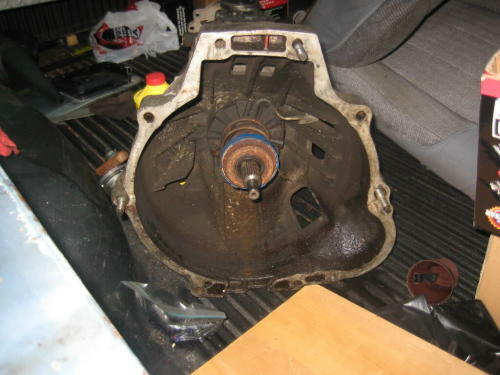 Installing this transmission really quieted my truck down. I can actually hear my engine now.